The University of Akron has started an esports program, including a Varsity esports team as well as club and recreational programs. They needed a PC that could handle the games the players would be running, as well as something that would survive the extended sessions of gameplay the teams would be participating in. The University of Akron esports staff worked with Gravity Gaming, a division of ByteSpeed, to develop systems for the Varsity team as well as for the club and recreational players. They put together a total of 93 systems for the University, with latest generation PCIe NVMe Solid State Drives, Graphic Cards, and CPUs. 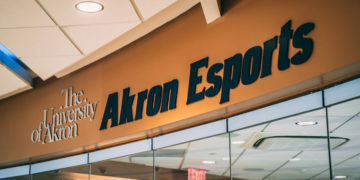 The University of Akron is one of the first 50 schools in the country to add varsity esports. The systems are now installed in several locations at The University of Akron. Games load very quickly on the custom-built systems, compared with previous generation gaming systems, and imaging of new systems — as well as re-imaging of systems with issues — also goes very quickly. The University of Akron is one of the first 50 schools in the country to add varsity esports to their roster, with varsity, club and recreational programs that include a dedicated varsity esports arena with nine 50-in. monitors in a 3×3 matrix, and scholarships for varsity players. Thirty to 35 team members participate in tryouts, wear team uniforms, train together and maintain practice schedules. The club program is built to support hundreds of students. Lest parents or school supporters worry that the program promotes or condones an unhealthy lifestyle, they need only look at the training regimens of professional esports teams. These teams participate in physical fitness programs, study nutrition and have supervised diets, and learn about developing better reflexes and observational skills, as well as developing team collaboration skills similar to other team sports. The average bystander might assume that esports is a relatively new phenomenon, but it actually goes back at least to 1972, when a Spacewar competition took place at Stanford University. Today, millions of people watch competitive gaming online and in arenas, and the International Olympic Committee is said to be considering adding esports categories to the Olympics. Games range from real-time tactical competitions such as League of Legends, Call of Duty, Rocket League, Rainbow Six Siege and Overwatch, to esports versions of football, soccer, basketball and other sports. Competitions between colleges and universities are common at the intramural level, and varsity esports teams are a growing segment as well. To establish themselves as a leader in this burgeoning arena, The University of Akron needed not only a strong gaming team, but also powerful gaming systems that could reliably run today’s most graphics-intensive and memory-demanding engines. The systems needed to be delivered within a strict budget, and with optimized performance, for reasons related to both graphics and storage performance, and toward optimized airflow and components that wouldn’t generate too much heat. After all, the systems would often be operating for many hours at a stretch. The coaching staff, including Head Coach and Director Michael Fay, Jr., Assistant Director David Kirk, Jr. and Club Coordinator Nate Meeker, partnered with Gravity Gaming to design systems that would match this profile. Gravity Gaming is a subsidiary of ByteSpeed, an IT systems builder based in Moorhead, Minnesota. The company specializes in custom computer systems, enterprise network solutions and support. They are Microsoft, Cisco, VMware and ASUS partners, among others. Jesse Hoffart, Gravity Gaming’s manager, worked with Kirk to develop the systems. 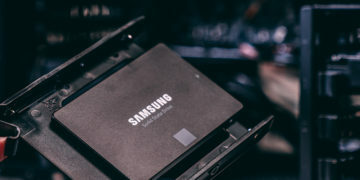 According to Hoffart, they placed emphasis on optimized air flow, efficient modular power supplies, cable management and using SSDs both for performance and because of their relatively low heat generation, especially compared to the other high-performance storage option, HDD RAID drives. 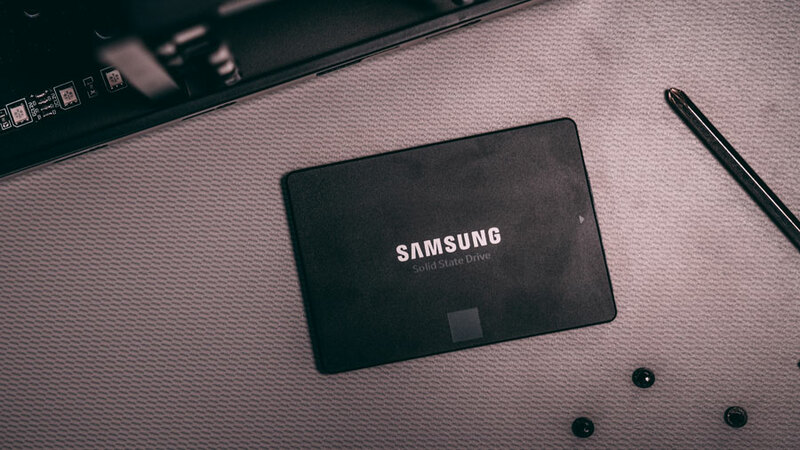 In the end, each of the 93 systems was outfitted with the Samsung 860 EVO 250GB SATA SSD. 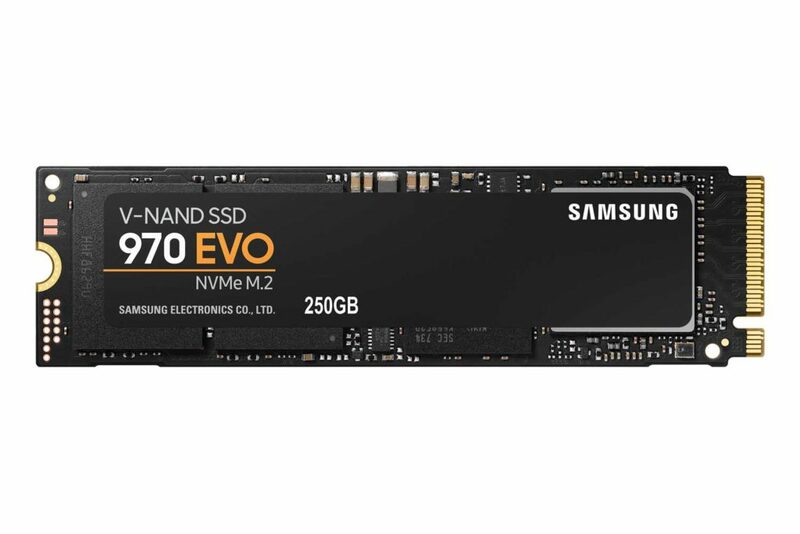 The systems were also designed to be upgradeable, with two M.2 NVMe slots on the ASUS motherboard that will be used to upgrade to Samsung 970 EVO SSDs in the future. GTX 2080 Ti graphics boards may be added when games with support for the new ray tracing capabilities begin to be in demand. 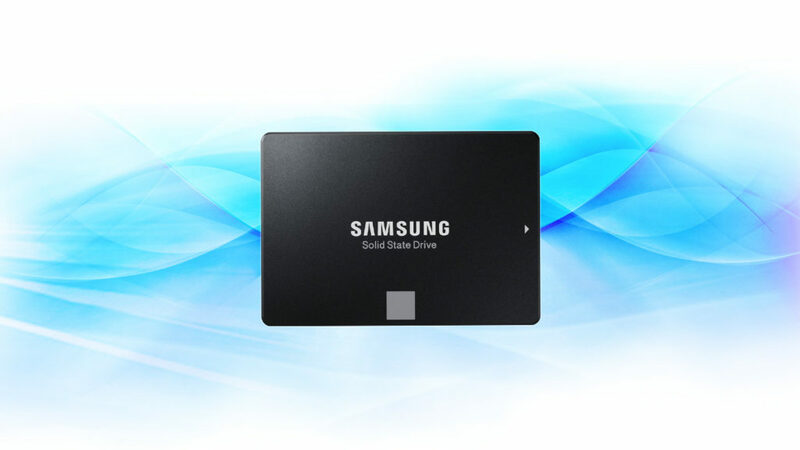 In addition to the lower power requirements and heat generated by the SSDs, performance was also a factor in selecting the Samsung 860 EVO. One popular title, Final Fantasy XIV, saw load times drop from 42.3 seconds when loading from a hard drive to 32.6 seconds with the 860 EVO, and down to 23.4 seconds with the 970 EVO. In addition to game performance, the team was able to re-image all 93 systems in less than a day using the 860 EVO drives. The new systems are networked with gigabit Ethernet, and Varsity systems can stream games via platforms such as Twitch or Open Broadcaster Software, or locally to the large monitor grid, to viewing areas in the student union and over the internet. The streams can be edited with Microsoft Mixer software, commentary can be added, and views of the arena can be streamed as well. Given the size of some of the supported games (over 10GB for some) on the esports network, an additional 2TB hard drive is used for nonessential storage. One PC is dedicated as a master image system. Development of changes to network and streaming software, graphics drivers and other additions can be tested on this system, which is then used to create disk images to deploy to the other systems as upgrades are needed or if systems become unstable in use. Specially designed for mainstream PCs and laptops, with the latest V-NAND and a robust algorithm-based controller. High-performance, highly reliable NVME M.2 SSD featuring exceptionally fast sequential speeds and outstanding endurance. The Drs. Gary B. & Pamela S. Williams Honors College at The University of Akron is hosting the university’s esports program, and provides academic oversight to help players develop leadership and collaboration skills, though players don’t have to be honors students. There is a great deal of interest in the program — even though the arena is just opening, there have been hundreds of sign-ups for club programs, and lots of interest in the scholarships and varsity program as well. The arena can be used for team competitions, where teams with multiple players face off against opposing teams, for tournaments, where single players compete with each other, and arenas, where as many as a hundred individual players start at the same time and compete until only one is left. Games may include martial arts, combat simulations, racing competitions, sports simulations and more. More than 30 team members participate in tryouts, wear team uniforms, train together and maintain practice schedules. The club program is built to support hundreds of students. According to Kirk, the university will be developing classes on supporting the esports network as well as on game development and other areas related to esports and gaming in general. 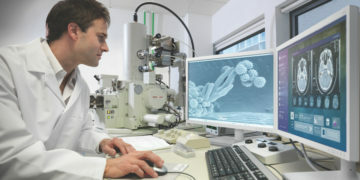 This includes not only gamers and programmers, but communications majors to narrate broadcasts, health and nutrition students to ensure gamers stay healthy and well-fed, engineering and computer science students to help support the systems and more. License and membership management software will be used to control systems, ensure that licenses are in compliance, prevent students from installing unauthorized software, and help with remediation of problems, as well as re-imaging as necessary for support issues. Gravity Gaming created a custom endowment as part of The University of Akron’s esports program, and shares part of their profits on the systems with the university, providing extra monitors and extra support during the initial deployment. Gravity Gaming will also make systems identical to the Varsity system available to students who wish to purchase their own PC for dorm or home use.